Even as the French turban issue involving Sikhs refuses to settle down, another religious symbol of the community is in the eye of a storm – this time back home in India. 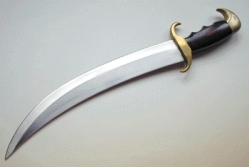 The ‘kirpan’, a three-foot-long sword kept by baptised Sikhs at all times as part of their religious attire, has raked up a controversy. Chandigarh, Oct 29 (IANS) — One of the five high priests of the Sikhs – jathedar (head) of Damdama Sahib Sikh temple Balwant Singh Nandgarh – last week refused to enter the US embassy in New Delhi after he was asked to deposit his kirpan. Taking a stand, Nandgarh declared that he would not part with the kirpan and refused to get into the embassy for a visa to the US. He has declared that he will take up the matter with four other high priests and the Shiromani Gurdwara Prabandhak Committee (SGPC) – the mini-parliament of Sikhs – so that the community could take a stand on the issue. But not everyone seems to agree with him. SGPC president Jagir Kaur tried to evade the issue saying the stand taken by Nandgarh was “his personal opinion” on the matter. Justifying her own opinion on the issue, she said most top Sikh leaders and other baptised Sikhs wear the smaller version of the kirpan when flying or travelling abroad. “I myself do that and others are doing the same,” she pointed out. Another senior Sikh leader and researcher pointed out that following the 9/11 attacks on the US, international security concerns, especially while flying and travelling abroad, did not permit keeping even the smaller version of the kirpan. Baptised Sikhs are supposed to keep the five K’s – Kada (steel wrist bangle), kangha (comb), kachha (long undergarment), kesh (long hair) and kirpan (sword) – at all times. “While flying, the kirpan has to be kept in the luggage (hold),” Jagir Kaur added. She was recently refused permission to go to the US by a Patiala court where she faces murder conspiracy charges for the mysterious death of her own daughter Harpreet four years ago. Some years ago, radical Akali leader Simranjit Singh Mann had refused to enter parliament when he was stopped by securitymen from carrying the long kirpan inside the house. He preferred to give up his Lok Sabha (Partliament) seat rather than go in without the kirpan. The French government had in August this year banned all religious headgear worn by students in schools. This included the turban worn by Sikh students to cover their long hair that they are required to keep as per religious traditions. The controversy over turbans continues and some Sikh students have been unable to attend school following the ban. Sikh institutions and the Indian government have urged the French government to exempt Sikhs from the ban, as turbans are part of their attire.